The Android Marshmallow update is increasingly growing elusive for the slightly older devices in the market. As the newer ones keep getting the latest version of the Android OS, those using older devices are getting more and more frustrated with questions of when their devices will get this update all over their faces. There is, however, some good news for those using HTC devices that include last year’s HTC One M9 and One A9, among other older devices such as the One M8, One M8 Eye, One M7, One E8 and quite a number of HTC Desire Eye smartphones. Here’s an update on the latest developments regarding the HTC Android Marshmallow update. HTC One M9 is last year’s flagship that some saw as an underwhelming performer. Nonetheless, the phone already has an Android 6.0 Marshmallow update being pushed through Verizon, T-Mobile and Sprint. At the moment, AT&T has yet to mention of the day it will be rolling out this update to the One M9, but it obviously be sooner than later since the other carriers started rolling it out in early March. If you own an unlocked HTC One M9, the update must have already reached your device since it started rolling out late last year. If you own the mid-range HTC One A9 smartphone, there is already an Android 6.0.1 Marshmallow update available for your device. The new incremental build brings additional emojis as well as the usual performance improvements, so, check out for the update in case you haven’t received it yet. HTC One M8 users were among the first to receive the new Android Marshmallow OS back in December last year. The beginning of this month saw T-Mobile and Verizon start rolling out this One M8 Marshmallow update to U.S. users. If you haven’t received the OTA notification on your One M8 just yet, it’s only a matter of time. Chinese users of the HTC One M8 Eye and the One E8 are currently receiving the latest Android Marshmallow OS on their devices. If all goes well, the same update will be in the U.S. by the end of this month or if worse, early next month. 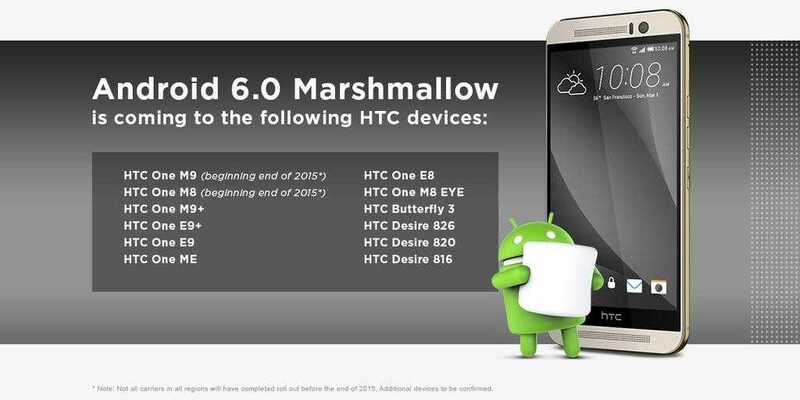 Initially, it was thought that the HTC Desire Eye will not be receiving the Android Marshmallow update. This 2014 model has, however, found its way to the Marshmallow bandwagon and it will be receiving this update as well. In fact, the update is already rolling out to HTC Desire Eye devices in Italy and United Arab Emirates. The same will come to the U.S. maybe before the end of this month or next month. In addition to the above-mentioned smartphones, it is also believed that there are other HTC devices that will be receiving this update. Speculations point at the One M9+, One E9+, One ME, Desire 816/820/826 and the Butterfly 3. There is, however, some bad news for those using the much older HTC One M7 as this device has not been listed among those compatible with the latest Android Marshmallow mobile OS.